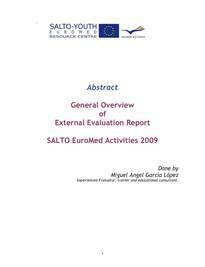 On this page, you will find all existing SALTO-YOUTH EuroMed reports. These include: Activity reports, EuroMed Meeting reports and other EuroMed reports. From 2000 until today, all SALTO-YOUTH EuroMed activity reports, in English or French. The main aim of Salto-Youth EuroMed Resource Centre is to improve, year after year, the quality of its activties. In that way, we have requested on surveys about the quality of our trainings and the impact of them on the professional and personal life of participants.